The “standing on the corner” corner was the first thing we saw when we drove into Winslow. You can’t miss it. It’s the center of center-city Winslow — which is two blocks along one street — and there’s a gaggle of tourists taking photos of the Glenn Frey statue and a flatbed Ford placed there by the Chamber of Commerce. It seems unfair that the statue is of Glenn Frey and not Jackson Brown. 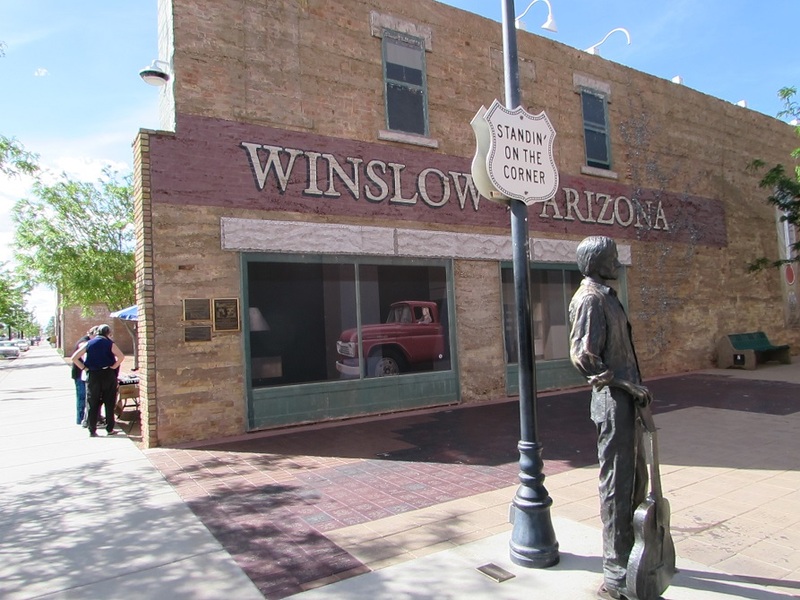 It was Brown whose car broke down in Winslow, Arizona, on his way to Sedona, and Brown who wrote the Winslow line for the hit song, Take It Easy. But Winslow’s fame and fortune were made when Frey’s band, the Eagles, put it at the top of the billboard charts. So Frey it is. “If the Eagles had never sung “Take It Easy,” I said to the woman at the information desk of the Winslow, Arizona visitor center, “what would there be to see in Winslow?” The information center is in a former Hubbell (of the Trading Post Hubbells) warehouse and some of the 19th century machinery remain as exhibits. We decided to take a chance and hightailed it over to the park, just outside town, about 15 minutes away from the info center. 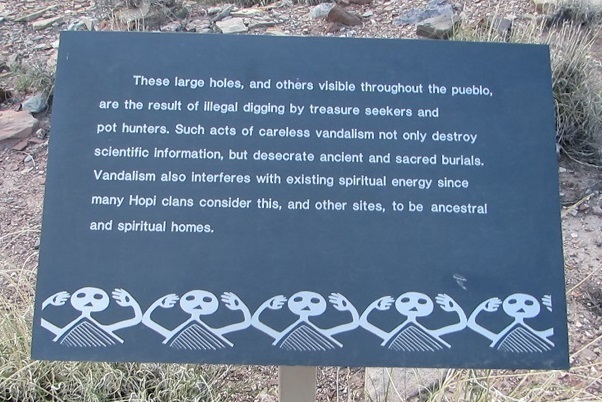 Homolovi is the Hopi name for Winslow, and means “place of the little hills.” The park holds the ruins of a community that housed the Hisat’sinom — a migrating people who were ancestors of the Hopi (Hisat’sinom is Hopi for “long ago people”) and who occupied the property in the 13th and 14th centuries. 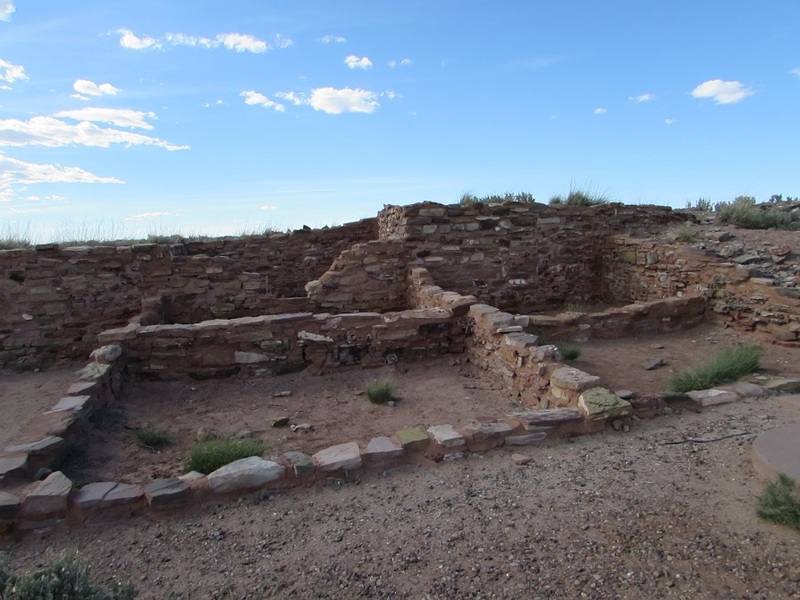 On the floodplain of the Little Colorado River, it was the perfect place to spend a few hundred years, farming, before they picked up and moved further north. There are several ruin sites within the park, and six miles of walking or biking if you want to go from ruin to ruin. But we had only about 30 minutes, so the ranger at the park visitor center sent us to the site that had the most to offer for our very limited amount of time. It was 4:15 by the time we got to the park and 4:25 when we got to the ruin. We ran the 1/2 mile loop that took us through the community. It’s sad that they need to put up signs like this. In the parking lot, watching us careen down the path back to our car, was a staff member in a truck. “I hope you didn’t hurry for me,” he said. He was the guy in charge of locking up the park and he very kindly offered to let us take more time among the ruins. “I’m in no hurry.” We didn’t take him up on his offer to go back to the ruins, but we did spend a few moments chatting with him and petting his very cute dog. After the park, we went back to Winslow, to the La Posada hotel, where we had dinner reservations. 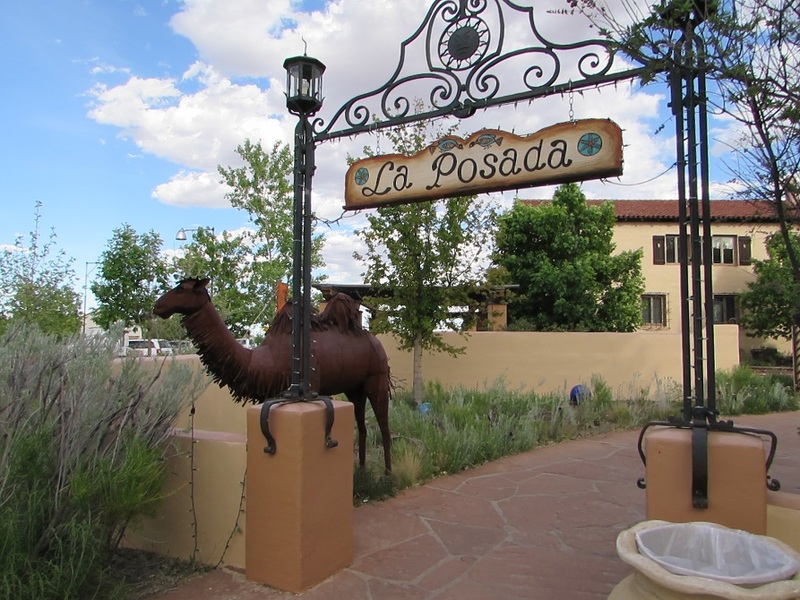 La Posada is Winslow’s second — after the Standing on the Corner corner — most popular tourist site. It was built in 1929 (designed by Mary Elizabeth Jane Colter, creater of the early 20th century southwest style of architecture) by the Santa Fe railroad for the Fred Harvey company. It was a hotel for 27 years, after which the Santa Fe railroad used it as office space. 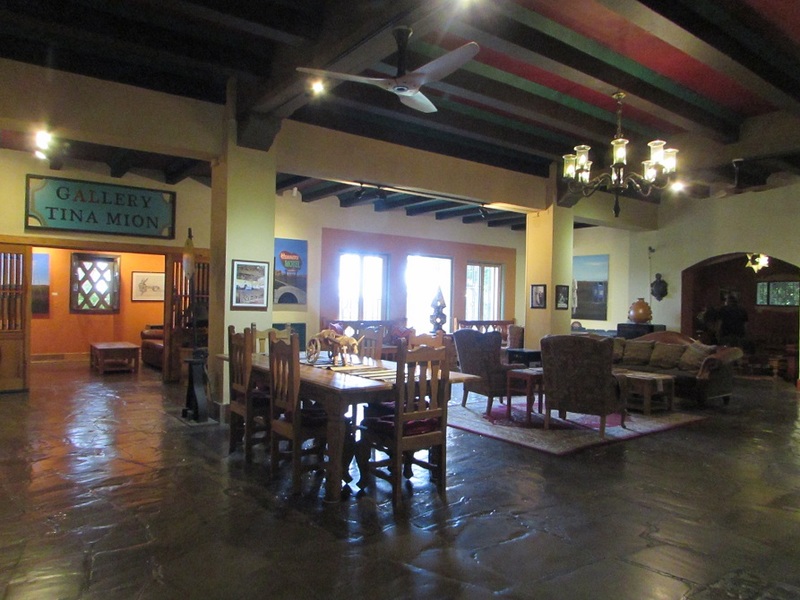 In the 1990s, the Santa Fe abandoned the building and there was talk of demolishing it before it was bought by a businessman and his artist wife and turned back into a hotel. They’ve made every effort to take it back to its early 20th century splendor and filled it with antiques. There are tours of the hotel, guided by women dressed as Harvey Girls. We had planned on staying at La Posada when I thought that Winslow was the closest town to the Petrified Forest. Then I found out that Holbrook was 20 miles closer, so we ended up staying there instead. Big mistake. Holbrook turned out to be a seriously depressing choice. Next time, we’ll drive the extra 20 miles and stay at La Posada in Winslow instead. Gallery | This entry was posted in Arizona and tagged Homolovi State Park, La Posada. Bookmark the permalink.